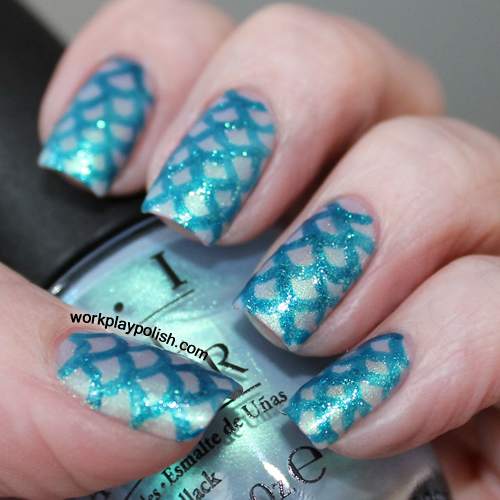 I'm sure I'm not the first person to immediately think "mermaid" when seeing these polishes for the first time. But alas, sometimes you have to be predictable. This mani is two coats of OPI Go On Green which is a sheer light blue/seafoamy green duochrome. I used a small brush and Zoya Charla to paint purposely-imperfect scales. Charla is very intense and it went on as easily as acrylic paint. I really like the finished product - but it was hard to photograph! Lots of finishes going on here! I just want to mention that the reaction I got yesterday from my Mystery Solved post was incredible. I received a lot of private notes. One person shared a story of finding their dad's famous homemade hamburger patties in the freezer a few years after losing him (mentioned with permission). Reaching back in time like that is both unnerving and wonderful. Finally, before I put this topic to rest, I had one last thought about it last night. I don't know why it didn't occur to me sooner. We had to take our own red nail polish to the Ohio State Board licensing exam. I'm wondering if the Zoya Carmen was the bottle mom used to take the test. I can't explain why else it was the only bottle of polish in that box. She used her other polishes regularly. It would make sense that she packed it away as a momento. I guess I'll never know. Anyway, thanks to all of you that reached out!